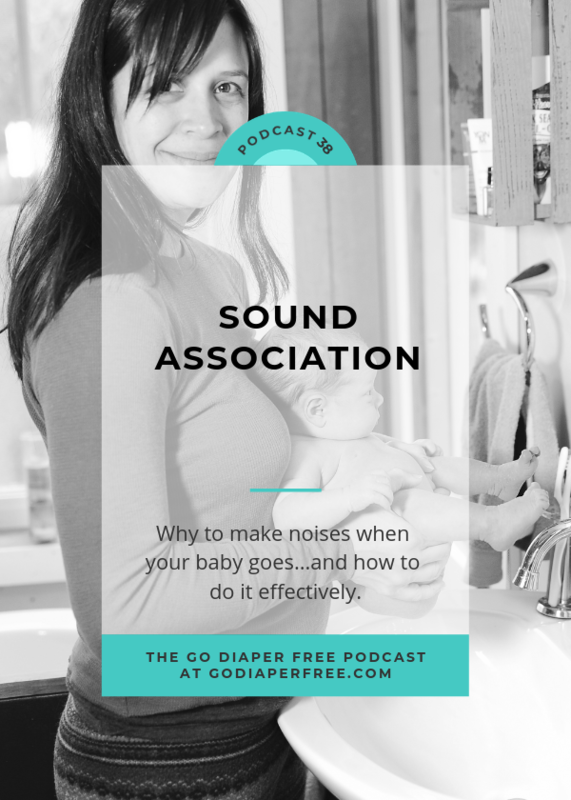 Today on the Go Diaper Free Podcast we're talking all about sound association! You may have heard the term sound association tossed around the EC community, and are wondering what this means. Or, maybe you already know what sound associations are but want to know how you start utilizing this great technique with your baby. Today we are going to dive into the topic so you know all of the hows, whys, whens and wheres of sound associations. Welcome to the Go Diaper Free Podcast, where we're all about helping you potty your baby as early as birth. I am your host, Andrea Olson, author and mom of five ECd babies. This is Episode 38, Sound association. Okay, so today we're going to talk about how to build sound association with your baby when starting EC. Elimination communication, as you probably know if you listen to this podcast, can be started any time between zero and 18 months of age. If you're starting with a newborn baby, let's call it a pre-mobile baby, not crawling yet, not rolling yet, zero to four months, around there, you're going to want to build sound association from the very beginning. How do you do this, and what is the point? Why would you even bother doing that, Andrea? Well, let me explain. Babies all over the world who have been EC'd from birth, or something like it, for all of human history, there have been very consistent reports. If you look at Laurie Bouquet's book, Infant Potty Training, she's got a lot of cross-cultural reports of this, where moms and caregivers and dads would make the sound of rushing water, "Sss," or, "Pss," or, "Shh," shushing, to encourage their baby to go to the bathroom, to go pee. Also a grunting noise, “Mm-mm.” Something like that, to encourage them that it's okay to poop right now. It's not that they're making their child go to the bathroom when they make these noises, but when they hold them in the position that they potty their babies in and they also make the noise, it is a cue to the baby that says it's okay to release here. All the clothing is off, I'm in the right location, this is going to be a hygienic experience. Let's do this. So that's why we want to build a sound association at this early age of when you hear this noise, it's okay to release your sphincters. Because contrary to the medical professionals books and training books that they learn from in nursing school and doctor school and whatnot, babies are born with sphincter control. They don't just all of a sudden get it at 18 months. That is BS developed by some very exquisite marketers in the diaper companies who wanted to sell more product. Off the conspiracy theory soapbox for just a second, sorry about that. I can't help myself. Anyway, sound association is really helpful to let the baby know through your cue, hey, it's a prompt. It's like an early form of, "Do you need to go pee?" Or, "Hey, it's okay." Or, "Hey, let's go to the bathroom right now." Without words, you're going to use the sound of running water “Psss” or grunting “Mm-mm.” Building sound associations; that's why we build it, the reason to do it, and all that. Now how do we do it? 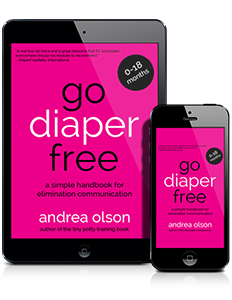 In my book, Go Diaper Free, which I highly recommend you get if you don't have it already, it will demystify all of this if you're trying to hodgepodge it together through my YouTube videos, and podcast, and blog. Just get the book, and get everything from the very beginning, no matter where you are. I'll list all the links for anything I mention in this episode in the show notes, which will be found at godiaperfree.com/38. In my book, I describe how to do sound association during naked observation time, and we're still talking about newborn babies. We'll talk about mobile babies and young toddlers in a second, and how this changes. Basically, you are going to do some newborn observation while they're naked, or with something like Tiny Trainers, which I also sell on my other site, so you can see immediately when they're wet, and when you see that they're peeing or pooping, you will make the sound while they're doing it. So this is really similar to a while back. We had a puppy, and teaching them how to go to the bathroom in the right place, because they already know how to go to the bathroom, and they already know they don't want to go in their little crate. You basically will say, "Go potty," while they're going to the bathroom outside, and that reinforces, "This is what you're doing while I say this." And then eventually, you can take them outside and say, "Go potty," and then they'll go, because they know it's okay to go, and that you would like for them to go. The same thing with teaching a dog how to sit, and I'm not comparing your baby to a dog, but what I'm saying is this is a very similar thing. It's a teaching process, it's a good example. Teaching your dog to sit, you don't say sit and then have them sit, you actually have them sit by holding up a treat a little bit high, and then they sit back, and as they're sitting, you say sit. So this is kind of the nature of sound association. With EC, we want to do it while they're going. So during naked observation time, which you can learn from in my book or from my website, and I'll include a link to an observation log that you can use as well, which really helps you get a handle on how often is my baby going. While we're doing naked observation, we're also building sound association. So when you see your baby pee, you say, "Pss," along with them. When you see your baby pooping, you go, "Mm-mm," along with them. If you have a poop mess, and you just started EC, and they go and poop in their diaper, while they're doing it you can grunt along with them to build sound association without actually putting them on the potty. So you can say, "Mm-mm," as they're going poop. Then the next time you see a signal or a sign, like a bearing down, like, "Oh, I've got to go, I've got to go." Or they're starting to push something out, you can say, "Wait." You can take off their diaper, hold them over the proper receptacle, and you can go, "Mm-mm." And they will remember that from the sound association you built while they were pooping in their diaper. So you don't have to do this completely diaper free, just wherever you're at, that's what you could start with. So we want to do naked observation, or moderately clothed. You can also do sumo style diapering where you have a diaper belt around their waist, and a very thin burp cloth I like to use, or a flour sack in between their legs, so that you can see right away when they're wet. This is for pee. Obviously with poop, that would be a disaster to clean up. Naked observation if you can do it. I always do observation over a pad, like a Kushies pad. I got the same ones for the last eight years. Over five babies, and I'll link to those in the show notes as well, but it's basically pea oil on the back, so it's waterproof, and then the top layer is cotton. You could also use a piece of felted wool on the bottom, with some kind of cloth, like a blanket, or a diaper. A pre-fold diaper, or a burp cloth, or something like that in between the wool and the baby. You don't want to ever really put a baby directly on the wool, you want something to absorb the pee in between. So as you see the pee or poop, you make that noise. Now I always get this question. Andrea, do I have to say the same noise that you make? No, you don't have to say the same noise that I make. You can make any noise that works for you. Some people will blow on the top of their baby's head, I've heard everything. You can do alternating. I like to do alternating, because at an early age, they usually will alternate whether they're pooping or peeing, and it kind of all comes out at the same time. So use whatever sound you want to use at that age that you want to use it. Now eventually your baby might start making the noise back. I know that my currently four-month-old is doing that. She's going, "Ah ah. Ah ah," as a signal to me that means she needs to go to the bathroom before she even goes. So she starts to say my sound association, my, "Mm-mm," back to me by saying, "Ah ah. Ah ah." It's amazing. Okay, so what do we do if our baby is not a newborn, or we feel really awkward making noises? No problem. By the way, the grunting noise also, they can feel the contraction in your belly as you're holding them in classic EC position. If you don't know what that looks like, get my easy start guide. It has a few of the most popular positions on it. That's at godiaperfree.com/start. It'll show you that. It's a little free download. You hold them in the classic position, and as you're going, "Mm-mm," they can actually feel your stomach contracting, and that encourages them to contract their stomach if they have poop. If you cue to them that it's okay to go, "Pss," or "Mm-mm", and they don't need to go, they're not going to go. No big deal. But it is a way of establishing two-way communication, and something that is very non-verbal in those non-verbal months. Now what about when we get into more verbal months? Or when we feel awkward as parents making weird noises? We want to use the word pee, pee pee, or the word poo poo, or potty, or caca, or wee wee, or whatever you use for pee and poop, or whatever you want your child to eventually signal back to you. So this is the important part here, you guys. You want to use a word, if you're going to use words, that you don't mind your child repeating in public really loudly, sometimes, to say that they need to go. Instead of using, "Pss," for pee, you'll say, while they're going pee, you'll say, "Pee pee." You could also use the sign language sign for it. You hold your hand in a fist, and you stick your thumb in between your first and second fingers, and you shake it side to side, which is the ASL sign for toilet. It's the sign for T shaken side to side, and also, there's a picture of that in my book, and the video version of this podcast will also have that on my YouTube channel. You can make the sign and say, "Pee pee," while they're going, and you could say, "Poo poo," while they're going. You can use the same sign, or you can use the sign for poop, and this builds sound association, and that while they're going, you are saying the same word or phrase. You can even say, "Go potty," or, "You're going potty.” Whatever you choose. And that goes the same for young toddlers. During observation, which is much different for a young toddler obviously, they might pee or poop everywhere, so we do it in a very controlled way, which is outlined in my book, if you're starting between 12 and 18 months. We also really want to use words, not noises at this age, for sound association. But a middle of the night pee, it's often nice to go, "Pss," in their ear, and they'll hear the sound of running water, and they will release. That's as much as I can tell you today about sound association. If you want to learn more, definitely get my book. Stay tuned, because I'm going to have a lot more how-to's on various topics in upcoming episodes. So anyway, I hope you found that very educational and inspiring, and you can try that out today. All the things I mentioned are linked to in the snow notes at godiaperfree.com/38. Thank you so much for listening. I'm Andrea Olson with Go Diaper Free, and this has been the Go Diaper Free Podcast at godiaperfree.com. We'll see you next week. Oops, me again, one more thing. Definitely leave a review if you would like for me to cover something in this podcast. Leave that in the review, tell me how you've enjoyed the show, tell me what you'd like to see in the future, and also in the comments of the show notes, by the way, we have great conversations over there. So hop on over there, and let me know what you're currently using for sound association these days. I'll see you over there, and thanks again. Bye for now. Share your thoughts by leaving a note in the comments section below! Have you used sound associations with your baby? Please leave a comment below with your experience!